Vampirella aka "Ellie" is tested like never before when Pantha thrusts her and Vicki into the lion's den. Jeremy Whitley is an excellent writer. Anyone who's read his 'Princeless' series or Marvel's 'Unstoppable Wasp' can attest to it. Here, with 'Vampirella' he seems like a man possessed giving Vampi a rapid-fire dystopian adventure the likes fans had not see before. In the center of this 'Mad Max: Fury Road'-like storm is a romance between Vampi and Vicki that is sweet and romantic despite the chaos that surrounds them. To make matters worse, the emergence of Pantha has imprisoned them both with their lives hanging in the balance. Whitley is certainly putting Vampi through her paces in one great wild ride. The issue opens with a seemingly comprehensive origin story for Pantha. Whitley is not afraid to go Scott Snyder on a reader with dense prose. Thankfully, Pantha's story is pretty intense. The disgraced daughter of Ra, guilty of murdering a village, was exiled and cursed. She lost her godly powers and left with only the ability to turn into a panther, open gateways and she could never die. Her bloodlust was subdued thanks to her friendship with Vampirella even pivoting her to seek a normal life. Unfortunately, dark angels would not let that happen and they destroyed everything she loved. With her bloodlust renewed she saught Vampirella once again. This time she is pissed. That backstory takes a big chunk of the issue but it lays the foundation for the cold-blooded ruthlessness Pantha wields in confronting Vampi and Vicki. Despite Vicki's interference or because of it, Pantha manipulates Vampi to conform to her will. Whitley has presented a Vampirella we have not seen before and it's a little shocking to see her so battered and bruised yet so in love. The juxtaposition of a happy loving Vampi with the brutally violent warrior is a lot to process after seeing a much more stable level-headed version over the last two years or so. Nonetheless, it's a story arc that demands your attention and keeps you guessing. Andy Belanger, Matt Gaudio, Alex Sanchez, and Lee Loughridge collaborate on the art to bring together a seamless series of violent color-coded scenes that transition from different time periods. With so much going it could have looked muddy and confusing but the team lays out a tough but fluid story. God bless letterer Travis Lanham who put in overtime to letter Whitley's issue 10 opus. 'Vampirella' #10 reaches a brutal climax that goes for the jugular. 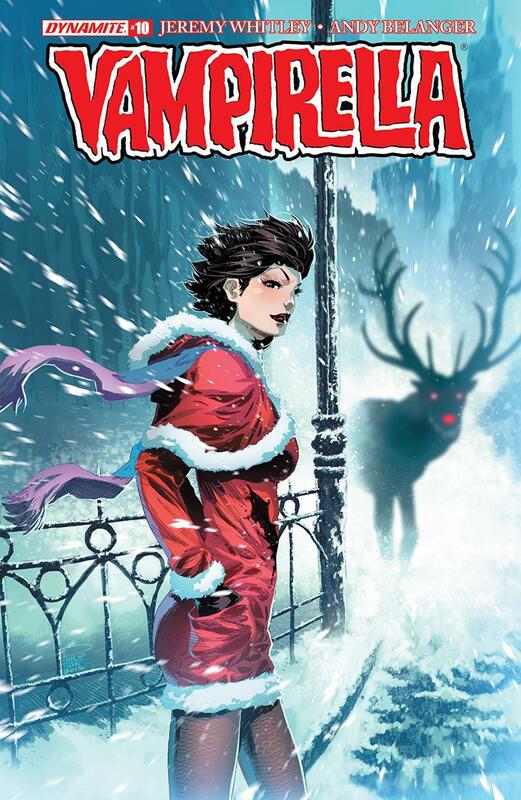 Whitley may be a bit verbose but he knows how to ramp up a story and you'll be holding your breath for Vampirella.